They began collecting phonographs and when Joan saw her first papier-mâché Nipper at an auction, she knew it had to be adopted for their home. It was a road kill Nipper badly in need of restoration. Joan had artistic skills and had taken art classes in high school and college. She brought the Nipper back to life and has been restoring and caring for Nippers ever since. The Nipper family grew and our knowledge broadened with each new Nipper item that came into our home. 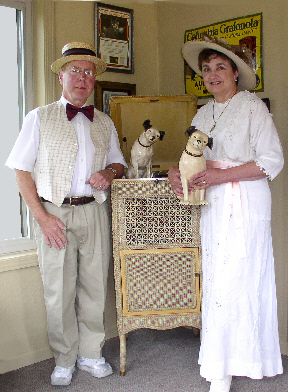 They have written several articles on Nipper for local and state newspapers and co-authored a book with Bessie and Floyd Seiter in 2001 titled, Phonograph Dolls that Talk and Sing. They are authors of the resource books: Phonograph Dolls and Toys, Nipper Collectibles, Nipper Collectibles Volume II, and Nipper Collectibles Vol III. Research publications include: Lewis Lueder, Official Photographer to Mr. Thomas A. Edison and Edison Little Folks Furniture 1926 - 2005. Nipper has been part of our family for over thirty years. We never owned a real live Nipper dog; however, we always have a couple of pet goats. Joan's mother placed an old Victrola in her bedroom when she was two years of age. The old music from the Victrola became part of her life. 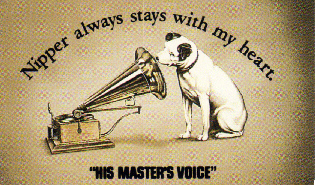 Every time she lifted the lid, she saw this cute little dog looking into the gramophone. As years passed, Joan went to college and her younger brother Bruce played with the Victrola until the spring broke. When her parents were moving to a smaller home, they asked if she wanted the old Victrola. Yes, she wanted this wonderful Victrola. Her husband Robin was intrigued by the technology of the music machine. The rest is history.